Page 38 from the first of Teresa Vanderburgh's musical scrapbooks - clippings of newspaper articles discussing both the Greek Tragedy, "Antigone" and Jewish Music. 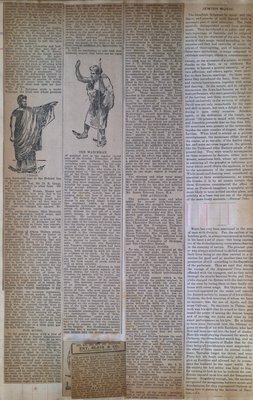 An image partially covered the newspaper article towards the bottom. It can be seen on Scrapbook # 1 - Page 38 - Picture 1.